April 4, 2015 (City Heights)—A suspect is under arrest for suspected Arson in City Heights. The Metro Arson Strike Team announced the arrest of 24-year-old Rolando Resendiz. April 1, 2015 (City Heights) - Two mattresses were ignited in City Heights early Tuesday morning just before 1 a.m. A half hour later, a commercial garbage bin erupted into flames. November 27, 2014 (San Diego) – Demonstrators in City Heights Tuesday night placed a sign over a memorial to slain San Diego Police officer Jeremy Henwood, making it read “Michael Brown Memorial Park.” The action was part of a protest over a jury verdict not to indict Darren Wilson, a white police officer who fatally shot an African-American teen in Ferguson, Missouri. Henwood was shot and killed in his police car after pulling over to assist a vehicle that had flashed its lights on August 7, 2011. A white beat officer in City Heights, one of his final actions caught on camera was giving a cookie to a young African-American boy at a nearby McDonalds. By numerous accounts, he was an officer who was respected in the community he patrolled. 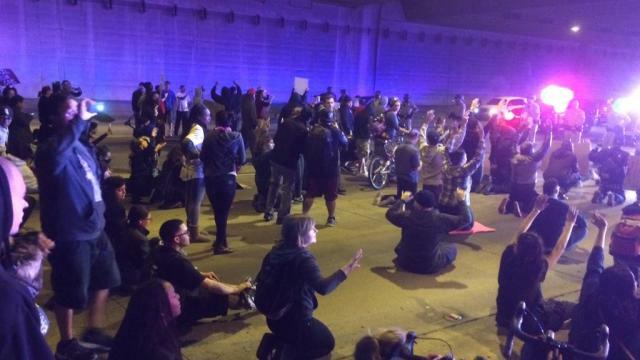 Update November 26, 2014: Two protests were held last night in San Diego. A downtown rally was peaceful, but protesters in City Heights engaged in civil disobedience blocking a bridge; some bottles were hurled at police officers, UT San Diego report. In Washington, President Obama called for calm after the jury verdict, but voiced concerns over the racial divide and mistrust of police, adding that despite strides made in civil rights, America still has a long way to go. November 25, 2014 (San Diego)—A Grand Jury in Ferguson, Missouri announced Monday night that there will be no indictments against police officer Darren Wilson in the shooting death of Michael Brown, an unarmed African American teenager. Jurors heard conflicting testimony from witnesses including some who said Wilson shot Brown when his hands were up as if to surrender, but others described Brown as confrontational and one witness claimed Brown charged at Officer Wilson, head down. The verdict has prompted protests in cities across the nation. California Campaign to End Police Terror has announced demonstrations statewide including a protest planned Monday night, November 25th at 6 p.m. at the City Heights library, located at 3795 Fairmount Avenue in San Diego. November 24, 2014 (City Heights) -- The San Diego Police is rounding up suspects in a wave of arson fires that have struck Mid-City neighborhoods in recent weeks. Investigators believe several arsonists may be responsible for at least 16 fires set mostly in neighborhoods in and near City Heights. Now, investigators are asking for the public’s help. September 9, 2014 (San Diego’s East County) - Many years ago, Councilwoman Marti Emerald and City Attorney Jan Goldsmith both worked as cab drivers. Now they are leading efforts to reform the City of San Diego’s taxicab policies and help hard-working cabbies. August 29, 2014 (San Diego) - Activist San Diego (ASD), a coalition of community organizations, in an effort to keep the issue of lives lost at the hands of law enforcement, will have a rally at the City Heights Performance Annex in San Diego. As will many other such rallies throughout the country, the rally will be in remembrance of Mike Brown and the town of Ferguson, Missouri. August 17, 2014 (San Diego)--City Heights residents organized a “hands up” tribute late Thursday in San Diego as part of a nationwide event calling attention to the police shooting death of unarmed black teenager Michael Brown in Missouri. About 100 gathered, wearing red ribbons on their arms. They joined hands and held a moment of silence for all victims of police violence. September 30, 2013 (City Heights) - On the weekend of the 21st, some 30 would-be urban farmers flocked to hear Farmer Bill Tall from City Heights Farmers Nursery offer advice on how to raise chickens. San Diego, along with several other jurisdictions locally, recently legalized backyard ownership of hens – though not roosters. Which came first, the chicken or the egg? Tall led off with tips on keeping eggs. “You don’t have to refrigerate them as long as you don’t wash them,” he said. He advised storing washed eggs in a separate container from foods. When a woman wanted to know why stores refrigerate the eggs, Tall answered, “Because they wash them,” then added that eggs do last longer in the refrigerator. July 19, 2013 (San Diego) – The Little Saigon 5th Annual Lantern Festival begins tonight at 5 p.m. and preparations are underway at Hoover High School, 4474 El Cajon Blvd., San Diego, as volunteers are assembling and hanging thousands of lanterns, erecting vendor booths and building the stage and Vietnamese Cultural Village. This year’s festival celebrates the formal designation of the new Little Saigon Cultural and Commercial District. June 22, 2013 (City Heights)--The Fifth Annual Health Fair in Honor of World Refugee Day willl be held on June 22 in the City Heights Community Park at 3795 Fairmont Avenue, San Diego from 1-5 p.m. This year Somali Family Services is partnering once again with the East African Collaborative - a collaborative of eight organizations working with East African communities in San Diego. The Fair’s theme is Healthcare Reform, and this year SFS aims to inform the East African community about the Affordable Care Act (ACA). Admission is free and includes free healthcare screenings and presentations, cultural entertainment, children's activities, giveaways, and more. March 18, 2013 (City Heights) -- Crawford High School student Terrance Hall said he doesn't always have bus fare and has to walk 18 blocks to get to school. Over 400 students in the Center City area alone take the bus to school every day at a cost of $5.00 per day or a regional monthly bus pass of up to $72.00. School Superintendent Richard Barrera reported that for four years he has been asking Mayor Jerry Sanders to do something to relieve students and parents alike of this unfair burden only to have his request fall on deaf ears. However the election of Bob Filner as San Diego’s new Mayor changed all that. Saturday morning, the Improving Transportation in City Heights (ITCH) held a press conference to witness the signing of a pledge to provide students free transportation on the city owned transit system. March 8, 2013 (City Heights) – Refugee farmers from Myanmar who participate in the International Refugee Committee’s agriculture training program will host a grand opening of their independent farm business , Hornbill Produce, at their new produce stand at City Farmer’s Nursery, 4832 Home Avenue in City Heights. From 10 a.m. to 4 p.m., enjoy live music with local Bluegrass/American Folk heroes Songs for People and traditional cultural dance from Myanmar. Tour the nursery and visit with the pony, chickens and goats. Stay for lunch at Nate’s Garden Grill. January 9, 2013 (San Diego) –In response to the long-time needs and present demands of the Vietnamese community, the Little Saigon Foundation is opening a Vietnamese Community Center in order to create a space for social services and cultural interaction. Early services include a Vietnamese Language School, Youth Leadership Development, Translation services, and physical health programs such as “Càng Khôn Thập Linh” (a combination of Tai-chi and yoga), as well as international ballroom dance. With spaces offered to local community groups to meet and hold events, the Center is the first Vietnamese Community Center in City Heights. Up until now, the organization has been operating on mostly the support of volunteers, but is now looking to add permanent paid staff. As such, the organizations will host the Little Saigon Fundraising and Award Dinner on Jan. 13 from 6 p.m. – 11 p.m. at the Lucky Star Restaurant, 3894 54th St., San Diego. November 25, 2012 (San Diego’s East County)—Refugees living in El Cajon and City Heights are invited to free workshops at the New Roots Aqua Farm, 4035 Fairmount Avenue in San Diego. Learn how to grow healthy organic vegetables in urban areas with no soil and minimal water! Also see New Roots’ 1,200 square foot aquaponics system that includes fish farming with tilapia that are sustainably raised and hormone free. Workshops in December will be offered in several languages including English, Swahili, Spanish and Arabic. See schedule below for details. November 26, 2012 (San Diego) – San Diego Police seek two suspects who followed two children into a City Heights home, than forced the youngsters and their mother into a closet at gunpoint at 6:34 on Sunday. Suspects then ransacked the house at 3230 Menlo Avenue in the Swan Canyon area and stole property before fleeing. Detailed descriptions of the suspects are below; one was bald and wore glasses, the other had a mustache and tattooed left ear. September 13, 2012 (City Heights) — San Diego is home to refugees from around the world – people who have fled war, famine or persecution in their homelands. Now you can help refugees rebuild their lives by purchasing fruits and vegetables grown by local refugees — delivered fresh each week at a cost of just $12. June 21, 2012 (City Heights – Somali Family Service of San Diego, in partnership with the East African Collaborative, will host its fourth annual Health Fair in Honor of World Refugee Day on June 23 from 1- 6 p.m. at the City Heights Community Park, south of the City Heights Weingart Branch Library at 3795 Fairmount Ave., San Diego. The event brings together East African communities in San Diego in a setting where residents can get health checkups and learn about health topics including mental health, how to access care, nutrition, exercise, preventive screening and care. Community groups will also provide educational information booths in the park. December 30, 2011 (San Diego)--Since 1933, the International Rescue Committee (IRC) has been helping refugees rebuild their lives after fleeing tumultuous wars or other catastrophes in their homelands. The IRC is currently active in 22 U.S. cities as well as overseas. In 2001, the IRC created its Microenterprise Program with the goal of helping refugees create their own businesses. In the last 10 years, the IRC has helped 175 San Diego-based refugees become small-business owners. To showcase some of the great refugee-owned eateries of East County, the IRC hosted a Micro-finance bus tour, offering patrons a chance to sample some delicious cuisine from Iraq and East Africa. September 3, 2011 (City Heights)--Joining similar actions across 21 states, San Diego nurses stood with community residents in urban San Diego on September 1 to bring their message of jobs, living wages, health care, education and housing. August 18, 2011 (Bonita) – A woman kidnapped on Fairmont Avenue in City Heights was beaten and sexually assaulted before escaping her attacker. After flagging down motorists, she was found naked along southbound 125 just south of Highway 54 in Bonita around 8:30 last night. Several drivers stopped to help the victim, 21.